It is the night before Arthur's biggest acting audition of his life and he has reached his breaking point. Arthur, who suffers from OCD, is madly in love…and confused. He has spent the last 6 months ‘hanging out’ with Anna — a Greek Goddess. But he doesn’t know where he stands with her. Are they friends? More than friends? Or are they friends with the potential to be more than friends? He calls Anna so he can find out once and for all where he stands with her to get closure. There’s only one problem: she doesn’t answer. And so begins a long night of tossing and turning where Arthur tries to fall asleep..but can’t..and instead spends the night reflecting on his ‘relationship’ with Anna. The staging is creative and challenging, using multi-media to represent computer screens, mobile phone screens, and dream sequences. There is constant movement, and the cast needs to manage transitions with impeccable timing. On opening night, it all flowed with barely a hitch, and the overall effect was tremendous energy and fun. 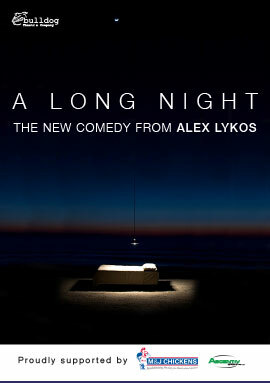 The challenge of a play that takes place in a single room, that was what drove the creation of A Long Night. The play had to conform to a few rules, no set changes that couldn’t be created through the use of lighting and the story would focus primarily on one character and the voice in his head. This one act wonder was a risky proposition and went through a number of discussions before taking on it’s final shape. Even then the question was, would anyone come and see it? The play was only 45 minutes long and very different from the hugely successful Alex & Eve trilogy, the decision was made to only put the show on for a week. We should have booked two. Any worry was proved to be unfounded when the play opened and word quickly spread about the quirky little comedy, the play came back for another run during the Sydney Comedy festival so that all the eager fans could get a chance to see Arthur and the gang. This quirky little comedy opened to packed houses leading to a return season in 2013 as part of the Sydney Comedy festival.